This research brief is the first of a two-part analysis that presents information on children adopted from foster care in the United States and their families using data from the 2007 National Survey of Adoptive Parents (NSAP) and the 2007 National Survey of Childrens Health (NSCH). This brief describes the characteristics of children adopted from the U.S. foster care system and presents findings related to the well-being of the children and their families. Factors associated with satisfaction and well-being. This research brief is the first of a two-part analysis that presents information on children adopted from foster care in the United States and their families using data from the 2007 National Survey of Adoptive Parents (NSAP) and the 2007 National Survey of Childrens Health (NSCH). This brief describes the characteristics of children adopted from the U.S. foster care system and their families, parents motivations for choosing to adopt from foster care, and findings related to the well-being of the children and their families. Part II also focuses on children adopted from foster care, describing their post-adoption supports and services including adoption subsidy payments, Medicaid and other insurance coverage, and other services such as support groups for parents and children. The analysis highlights the diversity among children adopted from foster care and in their adoptive families. It finds that the vast majority of children adopted from foster care are doing well and have parents who are satisfied with their adoption experiences. However, some families struggle with challenges including one quarter who do not describe their relationship with their child as warm and close. However, fully 92 percent of parents who adopted their children from foster care report that if they knew then everything they know now they would probably or definitely have made the same decision to adopt. Findings on child, family, and household characteristics, adoption motivation, and parent well-being and adoption satisfaction are presented below. Table 1 (page 4) presents information from the NSAP on the characteristics of children adopted from U.S. foster care. Overall, males represent 57 percent of the children adopted from foster care. Of all children adopted from foster care, 40 percent began living with their adoptive families at nine years of age or younger. AFCARS yields data on more recent adoptions that occurred in 2008; they indicate an equal gender distribution of children adopted from public foster care. Data on recent adoptions also show that 56 percent of foster children were five years or younger at the time of adoption finalization (which is typically later than the age the child begins living with their adoptive parents), suggesting that adoptions of children from foster care may be occurring at younger ages for more children than in the past. This finding may reflect effects of the Adoption and Safe Families Act of 2007 which encourages prompt adoptive placements when children cannot be reunified with their parents within a limited timeframe. Children adopted from foster care are less likely to be white than children in the general U.S. population. This finding is consistent with research demonstrating that minority children, and especially black children, are disproportionately involved in all stages of child welfare services (Hill 2006). While white children represent 56 percent of the general U.S. child population, they represent 37 percent of children adopted from foster care. Black children are over-represented among children adopted from foster care; 14 percent of the general U.S. child population is black, compared with 35 percent of children adopted from foster care. Among adoptions from foster care that were finalized in 2008 (from AFCARS data; see text box), 25 percent of children are black, suggesting that the racial disproportionality in adoptions may have declined. Prior to the 2007 NSAP data, most of what was known nationally about children adopted from foster care came from the Administration for Children and Families analysis of data from the Adoption and Foster Care Reporting and Analysis System (AFCARS). Several times in the brief we highlight AFCARS data to help frame the NSAP findings. However, the two data sources differ in some key ways. Most importantly, NSAP data represent all children adopted from U.S. foster care ages 0 to 17 at the time of the NSAP interview. So the NSAP represent the approximately 661,000 U.S. children under age of 18 in 2007 who had been ever adopted from foster care. In contrast, AFCARS data for the same year pertain to the 53,000 whose adoptions occurred in 2007. Changes in public child welfare practices and policies over a period of up to 17 years are at least partially reflected in NSAP data, particularly for children adopted at younger ages. (The longer the tenure of the adoption, the younger the age at which the adoption must have occurred in order for the children to have been include in the NSAP sample.) In addition, the NSAP surveyed adoptive parents, while AFCARS data is entered by caseworkers into child welfare case management systems by caseworkers. Differences in methodologies of the two data sources mean that readers should exercise caution in interpreting comparisons across them. Slightly over half of children adopted from foster care (54 percent) have special health care needs, compared with 19 percent of the general child population. Children with special health care needs include those who currently experience at least one out of five consequences attributable to a medical, behavioral, or other health condition that has lasted or is expected to last for at least 12 months. However, it is important to note that 76 percent of children adopted from foster care with special health care needs are considered by their parents to be in excellent or very good health. While this may appear contradictory, many children with special health care needs have conditions, such as asthma, that may be well controlled with medication or other treatment. The NSAP collected information on the childs age at time of placement into the family who adopted them. Overall, 20 percent of children adopted from foster care were six years or older at the time of placement, 45 percent were under one year of age, and 35 percent were between the ages of one and five years old. Table 2 presents characteristics of parents who adopt children from foster care. According to the NSAP, 70 percent of children adopted from foster care live with married parents. (For adoptions finalized in 2008, 68 percent of children were adopted by married parents.) Over half of children adopted from foster care (54 percent) have parents over age 50, and 16 percent have parents over age 60, indicating that adoptive parents are older than parents generally. Many adoptive parents likely have previous parenting (and life) experience that may benefit them. For a small share, however, problems accompanying aging could potentially challenge their parenting abilities before the child reaches adulthood. Many children adopted from foster care have at least one parent who does not work full time. About one out of three children (31 percent) have either a single parent who works full time, or two parents, both of whom work full-time, while 45 percent have at least one parent who works a less than full-time schedule. Just under one in five children (18 percent) have parents who do not work (but are not retired), while six percent of children have retired parents. Table 3 (page 10) presents data on characteristics of the households of children adopted from foster care. 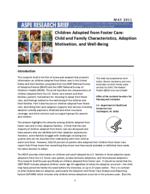 NSAP captured information on the presence of birth and adoptive children in the household, whether the adoption was transracial, transethnic, or transcultural, and whether there was post-adoption contact with birth family members. The NSCH collected information on the region of the country in which the adoptive family resides and whether the area is a metropolitan statistical area (that is, urban or suburban as opposed to rural), as well as information on household income. The year in which the adoption was finalized was derived from data in NSCH and NSAP. One practice that has received increasing attention and priority among state and local child welfare agencies is keeping siblings in foster care living together while in care and placed together in adoptive homes. Figure 4 shows the distribution of children adopted from foster care by the status of childs birth siblings. As shown, 82 percent of children adopted from foster care have known birth siblings. Of these children, 41 percent have siblings who were also adopted by their parents, while fewer than one out of four (22 percent) have siblings never available for adoption. In addition to asking about whether children were adopted with their birth siblings, the NSAP asked about the sibling structure of the families into which the children were adopted. Forty percent of children adopted from foster care live in families with other adopted siblings as well as other children born to the parent. Slightly over one quarter (27 percent) of children adopted from foster care live in families with other adopted siblings only, while slightly fewer than one quarter (22 percent) live in homes with other children born to the parent and no adopted siblings. Eleven percent of children adopted from foster care are the only child in the family. (See Figure 5.) Most children adopted from foster care (56 percent) live in households with one or two other children; 16 percent live in households with at least three other children. Among children not adopted by relatives, almost four out of ten (39 percent) have had some post-adoption contact with birth family (as, by definition, do all children adopted by relatives). While many adoptive families have some type of contact with birth family members, one might expect families who adopt older children to be more likely to have this type of post-adoption contact given the child would be more likely to have lived with his/her birth family for a longer period of time than children placed as infants or very young children. One might also expect that children whose parents were their foster parents prior to the adoption may also have more post-adoption contact with birth parents. However, neither of these assumptions hold true. Post-adoption contact does not vary significantly by whether the child was older or younger than age 6 at placement. Also, it does not vary depending on whether the parent was a foster parent. As shown in Table 3, about twice as many children adopted from foster care live in the South than in the West or Northeast areas of the country (37 percent compared with 18 percent and 18 percent, respectively). Slightly over one quarter (27 percent) of children adopted from foster care live in the Midwest. The percentages of adopted children living in the Northeast and South are proportional to the percentages of all children living in these regions. However, the share of the child population that is adopted is comparatively high in the Midwest and comparatively low in the West. Specifically 22 percent of all children live in the Midwest, but 27 percent of all children live in this region; 24 percent of all children live in the West, but 18 percent of all adopted children live in this region. In addition, 75 percent of children adopted from foster care live in a metropolitan statistical area, a share that is similar for the general population. One quarter of children adopted from foster care live in households with income greater than four times the poverty threshold. However, almost half (46 percent) of children adopted from foster care live in households with low incomes (at or below 200 percent of the poverty threshold), including 16 percent who live in poor households (with incomes below 100 percent of the poverty threshold; see table 3). What motivates families to adopt is an important question for the child welfare field, yet to date, little is known due to the lack of nationally representative data on adoptive families and the limited research in general on the topic. NSAP data can help to inform this issue. Parents who had adopted from foster care responded to two sets of questions in the NSAP about their motivations. Figure 7 presents findings on parents reasons for choosing to adopt for those children adopted from foster care. As shown, the most common motivating factor is to provide a permanent home for a child (86 percent). Over sixty percent (61 percent) of children adopted from foster care have parents who were motivated by wanting to expand their family, while 39 percent have parents motivated by infertility. Additionally, 24 percent of children have parents who wanted a sibling for a child, and 11 percent have parents who had already adopted siblings of the child. Parents of children adopted from foster care also described why they chose to adopt from foster care rather than privately, whether domestically or internationally. As shown in Figure 8, 60 percent of children adopted from foster care have parents for whom the lower cost was a factor in their decision to seek a foster care adoption. Over one quarter (28 percent) have parents who felt that foster care adoption was faster than other adoption types, and this played a role in their choice of adoption methods. A quarter of children adopted from foster care have parents who wanted a special needs child (24 percent); roughly a quarter (23 percent) also had adopted from foster care previously. For each of the possible reasons for selecting foster care adoption, parents also described the importance of that reason. Parent respondents were also asked to identify whether each motivating factor cited was a very important reason. The most common factor that was described as a very important reason was to help a child in need. Almost one-third of children adopted from foster care (30 percent) have parents for whom the cost of foster care adoption was a very important reason for deciding on that route for adoption. Not surprisingly, children placed for adoption at age six or older are more likely than those placed at younger ages to have parents who chose foster care adoption at least partly due to wanting an older child (38 percent compared with 8 percent). Children whose adoptions were finalized post-ASFA are more likely than those whose adoptions were finalized earlier to have parents who chose foster care adoption because they had adopted that way previously (26 percent compared with 12 percent). Children adopted from foster care and living in the Western region of the country are more likely to have parents who wanted to help a child in need than are children living in the Southern and Midwestern regions of the country (29 percent, compared with 8 percent and 4 percent, respectively. Children who live with two married parents are more likely than other children to have parents for whom the lower cost of foster care adoption played a role in choosing that type of adoption (68 percent compared with 44 percent). In this section we present indicators related to parenting and adoption satisfaction. We describe how parents feel about the parent-child relationship, the childs effect on the family, and the satisfaction of children and parents with the adoption. In general, three-quarters of all children adopted from foster care have a relationship their parent feels is very warm and close. In addition, 36 percent of children adopted from foster care have a relationship with their parent that is better than their parent ever expected, and 40 percent have parents who feel that having the child in their life is better than ever expected. Eighty-one percent of children adopted from foster care have parents who would definitely make the same decision to adopt again, and an additional 11 percent probably would make the same decision to adopt again. (See Figure 9.) Clearly, the majority of children adopted from foster care have parents who are satisfied with the relationship. It is important to note that this brief focuses only on children with legally finalized adoptions from foster care as of 2007. For some children, placements disrupt before finalization or dissolve following finalizations, and these children were not part of the NSAP sample. At any given time, there may be families who adopted children from foster care who have considered disrupting or dissolving the adoption in the past, and a few of these families may go on to end their adoptions. However, in the NSAP, the number of children whose parents ever considered dissolution is so small that reliable estimates about the population cannot be generated. Parent-child relationships and adoption satisfaction vary depending on several child, parent, and family characteristics, including the age at adoptive placement and the presence of special health care needs. Parent-child relationship very warm/close: Based on parents responses to the question, How would you describe your relationship to [your child]? we examined children whose parents responded very warm and close, compared with those who responded somewhat warm and close, somewhat distant, or very distant. Parent-child relationship, compared to parental expectations: This indicator is based on the question, Thinking about [your child]s relationship with you , would you say things are better than you ever expected , about what you expected , or more difficult than you ever expected? Having the child in their life, compared to parents expectations: Parents answered the question, So far , how has having [the child] in your life compared with what you thought it would be like? Responses included better than you expected, about what you expected, and more difficult than you expected. Effect of child on family: Parents answered the question, Overall, how has having [the child] in your life affected your family? Responses included very positively, somewhat positively, mixed, somewhat negatively, and very negatively. Parents would make the same decision to adopt their child: Parents were asked, If you (and your spouse/partner) knew everything about [your child] before the adoption that you now know , how might that have affected your decision to accept him/her for adoption? Responses included whether the parent would have definitely, probably, probably not, or definitely not have accepted the child. Parent considered dissolving the adoption: Parents were first asked how having their child in their life affected their family and whether they would have made the same decision to adopt the child. If they responded that the child affected their life somewhat or very negatively or that they would probably or definitely not have accepted the child, they were asked: Have you [or your spouse/partner] ever thought about ending this adoption? We identified parents who answered yes, compared with those who answered no or who were not asked the question due to their responses to the previous questions. Parents perceptions of the childs feelings about adoption: Parents of children at least five years old were asked, Overall, how do you think [your child] feels about being adopted? Responses included that the child feels positive, mostly positive, mostly negative, or negative about it. Three percent of children ages 5 and older were excluded from this analysis because their parents reported that the child did not know that he or she had been adopted. Age at placement. Children placed in their adoptive home at age 6 or older are half as likely as those placed at younger ages to have a very warm and close relationship with their parent (41 percent compared with 84 percent). They are also twice as likely to have a relationship with their parent that is more difficult than their parent expected (33 percent compared with 16 percent). Children placed at age 6 or older are also less likely to have a positive effect on the family than children placed at younger ages (59 percent compared with 89 percent). Even so, the majority of children placed at age 6 or older (84 percent) do have parents who would definitely or probably make the same decision to adopt again. The association between older age at placement and problems with the parent-child relationship or adoption satisfaction are important for program managers and policymakers to consider, given the renewed emphasis on finding adoptive placements for older children. Ensuring that adequate supports are provided to families both pre-adoption and post-adoption will be important to the well-being and satisfaction of many families adopting these youth. Special health care needs. In general, children with special health care needs (CSHCN) adopted from foster care tend to have less positive parent-child relationships and their parents report lower levels of adoption satisfaction than do those without special health care needs. One quarter of CSHCN have a relationship with their parent that is more difficult than the parent ever expected, compared with 12 percent of those without special health care needs. Similarly, a smaller share of CSHCN than those without special health care needs have a parent who feels their relationship with the child is not very warm and close (71 percent compared with 80 percent), and, they are less likely to have a parent say that the child has a positive effect on the family (76 percent compared with 90 percent). Yet despite the challenges that some CSHCN adopted from foster care experience with the parent-child relationship and with adoption satisfaction, they are equally likely as children who do not have special health care needs to have parents who say they would definitely or probably make the same decision to adopt. Other characteristics. Children with two married parents were less likely to have parents report the parent-child relationship was very warm and close than children who did not live with two married parents (70 percent compared with 87 percent). Also, while the quality of the parent-child relationship and adoption satisfaction consistently vary depending on age of adoptive placement and on the presence of special health care needs, they generally do not vary based on the race and Hispanic origin of children, household income, whether or not parents had adopted childrens birth siblings, transracial/ transcultural/transethnic placement, and whether the adoption was finalized pre- or post-ASFA. Demographic and other characteristics of children adopted from foster care differ from those of children in the general U.S. population. For example, boys, non-Hispanic black children, and children with special health care needs are all over-represented among children adopted from foster care. Racial disparities have been observed in the child welfare system consistently (Hill, 2006). Researchers have struggled to explain the causes of disproportionality (since most studies have not found black children to be maltreated at higher rates than children of other ethnicities) and to identify ways of effectively improving outcomes for minority children. The higher prevalence of special health care needs is also a consistent finding of research on adopted children (Nickman et al, 2005), with mental and behavioral health issues occurring at particularly high rates. However, NSAP findings on gender are somewhat more pronounced than AFCARS reports for recent adoptions. While the majority of children were adopted at young ages, a significant portion 20 percent were adopted at age six or older. Data on recent adoptions, from AFCARS data, show higher proportions of adoptions at older ages. The difference most likely results from the fields recent emphasis on permanency and the adoption of older children. Some children adopted from foster care are living with their birth siblings. Eight out of ten children adopted from foster care have known birth siblings and, of these, four out of ten have birth siblings who were also adopted by their parents. Many also live in families with other children both adopted by and born to their parents. In fact, four out of ten children adopted from foster care live in families with other adopted children and with their adoptive parents birth children. Many also live in racially or ethnically diverse families, as well. A little over one quarter of children adopted from foster care have been adopted transracially, transethnicly, or transculturally. In addition, among children not adopted by relatives, almost four out of ten have had some post-adoption contact with their birth family. Parents who adopt children from foster care are diverse. Seven out of ten children adopted from foster care live with married parents and about one out of ten have single parent who is at least 50 years older than the child, or two parents, both of whom are at least 50 years older. Many children adopted from foster care nearly seven out of ten have at least one parent who does not work full-time. Among children adopted from foster care by non-relatives, three-quarters were adopted by parents who were previously the childs foster parent. A substantial share of children adopted from foster care live in families with low household incomes; almost one half live in households with incomes at or below 200 percent of the poverty threshold. More than eight out of ten children adopted from foster care have parents who chose to adopt in order to provide a permanent home for a child. Many also have parents who were motivated to adopt from foster care due to the lower cost of foster care adoption; this is true for six out of ten children adopted from foster care. Not surprisingly, children placed for adoption at age six or older are more likely than those placed at younger ages to have parents who chose foster care adoption at least partly due to wanting an older child. The vast majority of children adopted from foster care have parents who are satisfied with the parent-child relationship. Three-quarters of all children adopted from foster care have a relationship with their parent that is very warm and close, and over ninety percent of children adopted from foster care have parents who definitely or probably would make the same decision to adopt again. However, children placed in their adoptive home at age 6 or older are less likely than those placed at younger ages to have a very warm and close relationship with their parent. In addition, children with special health care needs tend to have less positive parent-child relationships and lower levels of adoption satisfaction in the family than those without special health care needs. Overall, findings from the NSAP indicate that most children adopted from foster care are doing well and have parents who are satisfied with the adoption. However, there are some reasons for concern. Nearly half live in households with low incomes, and about one out of ten have parents who are more than 50 years older than the child. And while most have parents who are satisfied with the adoption, one quarter of children adopted from foster care have parents who do not describe their relationship with the child as very warm and close, and a small percentage (6 percent) have parents who would definitely or probably not make the same decision to adopt the child, knowing everything they now know. It seems clear that post-adoption supports and services may provide important assistance for a significant portion of families adopting children from foster care. Part II of this series of briefs presents NSAP findings on the variety of services and supports families adopting children from foster care receive and services parents report needing but not receiving. Hill, Robert B. (2006). Synthesis of Research on Disproportionality in Child Welfare: An Update. Seattle, Washington: Casey Family Programs. Hughes, D.A. (1999). Adopting children with attachment problems. Child Welfare, 78(5):541-560. Nickman, S.L., Rosenfeld, A.A., Fine, P., et al. (2005). Children in adoptive families: overview and update. Journal of the American Academy of Child and Adolescent Psychiatry, 44:987-995.
van den Dries, L., Juffer, F., van IJzendoorn, M.H., Bakermans-Kranenburg, M.J. (2009). Fostering security? A meta-analysis of attachment in adopted children. Children and Youth Services Review, 31(3): 410-421. Vandivere, S., Malm, K., and Radel, L. (2009). Adoption USA : A Chartbook Based on the 2007 National Survey of Adoptive Parents. Washington, D.C.: The U.S. Department of Health and Human Services, Office of the Assistant Secretary for Planning and Evaluation, 2009. All analyses pertaining to race and Hispanic origin examined mutually exclusive groupings. In other words, the racial categories white, black, Asian, and other exclude individuals who are non-Hispanic. Those identified as Hispanic may be of any race. Differences described in the brief are statistically significant at the 95 percent level or better; differences that are marginally significant (at the 90 percent confidence level) are noted. The five consequences attributable to a medical, behavioral, or other health condition include:1) ongoing limitations in ability to perform activities that other children of the same age can perform, 2) ongoing need for prescription medications, 3) ongoing need for specialized therapies, 4) ongoing need for more medical, mental health, or educational services than are usual for most children of the same age, and 5) the presence of ongoing behavioral, emotional, or developmental conditions requiring treatment or counseling. The most recent federal data on children in foster care as of the end of FY2008 (including all children in foster care, not solely those awaiting adoption) show that 71 percent experienced neglect, 16 percent were physically abused, 9 percent were sexually abused, 7 percent were psychologically abused, and 2 percent were medically neglected. The differences are likely due to the way in which NSAP posed the question to adoptive parent respondents. The NSAP instrument asked parents about the likelihood that their child had been abused or neglected prior to arriving in their home. The survey did not ask adoptive parents if the foster care or adoption agency had identified specific types of abuse or neglect or whether they had obtained information from the childs foster care case file. Thus, while some adoptive parents may have received information from the agency or case file, others may have based their responses to this question on their beliefs and experiences or on the childs behavior. This includes both adopted siblings who are birth siblings of the child as well as other children adopted by the parents. We categorized children having been transracially adopted if their parents reported that their child was of a different race or ethnicity or from a different culture compared to themselves and their spouse or partner (if they had one). Percentages for the general U.S. child population come from the authors analyses of 2007 NSCH data. The estimate for children placed at younger ages (8 percent) is unreliable. This difference is statistically significant at the 90 percent level. The estimate for children with adoptions finalized in 1997 or earlier, before ASFA, (12 percent) is unreliable. Estimates of the rates of disruption can be found at http://www.childwelfare.gov/pubs/s_disrup.pdf. Another difficulty in using the NSAP to identify the frequency with which families consider dissolution is that not all NSAP respondents reported whether they had considered dissolution. To be sensitive to parents, the NSAP asked the question only if the parents had reported the adoption negatively affected their family or they would definitely or probably not have accepted the child, knowing everything they now know about the child (Vandivere et al. 2009). Children placed at older ages are less likely than those placed at younger ages to have a parent say he or she would definitely or probably make the same decision to adopt (84 percent compared with 97 percent; this difference is significant at the 90 percent confidence level.) Also, children placed at older ages are less likely to have a parent say the having the child in their live is better than or about as they expected (69 percent compared with 89 percent). However, children are equally likely to feel positively about their adoption, according to their parent, regardless of age of placement. AFCARS shows slightly more boys than girls in the adopted and waiting for adoption categories in most years. See annual AFCARS Reports at http://www.acf.hhs.gov/programs/cb/stats_research/index.htm#afcars.